Th Cob, at Lyme Regis, made famous in the film, "The French Lieutenant's Woman", evocative in the film and also the day we went, in late October. 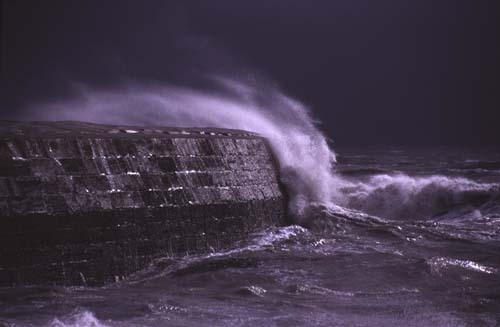 The Westerly wind was very strong that day, hitting the breakwater with such force as to send the waves crashing over. I underexposed the image, which creates this awesome, moody feel, a situation you may not repeat easily.